(Spanish American War Patriotic) Accept a Soldier's Happy New Year from Manila 98-99, red and blue patriotic label showing American Flag and Tent scene with starred border, affixed at upper left of cover bearing 2¢ pink tied by "Mil. Sta. No. Manila, Phil. Isl'date stamp. May 31 '99" duplex to Colorado Springs, Col., brown "Soldier's Letter, O.M. Dalfy, Chaplain, 1st S.d. Inf U.S.V." 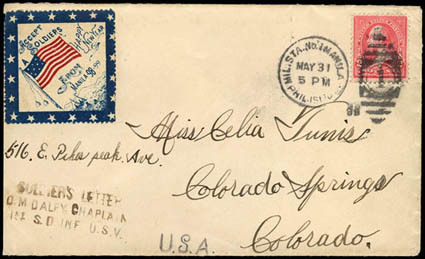 three-line handstamp, Colorado Springs (7.15) arrival backstamp, Very Fine and rare patriotic label use, ex-Hahn. A link back to Sale 75 - Lot 173, along with its description, will be appended to your message.